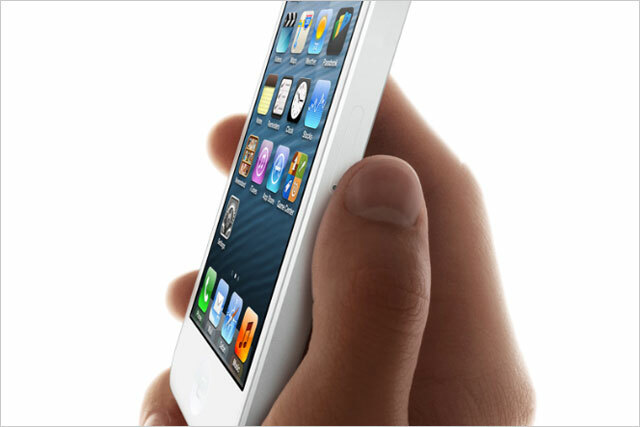 Apple has unveiled its hotly-anticipated iPhone 5, which is 4G enabled but lacks near field communication technology. The iPhone 5, which is Apple's thinnest, lightest, fastest and most powerful phone yet, was launched yesterday (12 September) by Tim Cook, the company's chief executive, with the usual media furore. The device will run on the 4G network, which in the UK will give EE, which is weeks away from launching its 4G network, a huge advantage over rival operators, who will not be able to launch the higher-speed data service until next year. The device goes on sale in the UK on 21 September. Apple has yet to disclose specific pricing of the models in the UK, though prices will start from £529. In the US, Apple has listed prices of $199 for the 16GB version, $299 for the 32GB version, and $39 for 64GB version. EE has announced that Orange and T-Mobile customers will be able to purchase the new iPhone and then switch to EE to be able to access the 4G network when it launches. The iPhone 5 is 18% thinner and 20% lighter than the iPhone 4S. The device is the same width as the previous model, but is taller, making the Retina display larger, at four inches. It lacks NFC features, which would enable contactless payment and were expected to be included. The camera is an eight megapixel model, which is the same as in the iPhone 4S, and a lower specification than LG, Sony and Nokia’s most recent devices. A faster chip has been built into the phone, which Apple claims will improve battery life. However the handsets require a new socket for its charger, meaning owners will need to fork out £25 for an adapter to plug the handset into other devices. In terms of advertising, Apple did not announce any changes to its ad platform, iAd. Changes to the screen size will affect developers who will have to take this into consideration when developing apps. Philip Schiller, senior vice president of worldwide marketing at Apple, said: "iPhone 5 is the most beautiful consumer device that we’ve ever created. "We’ve packed an amazing amount of innovation and advanced technology into a thin and light, jewel-like device and we think customers are going to love it." Tim Dunn, head of mobile strategy at Glue Isobar, told Marketing there is "nothing interesting or innovative" about the new device. He added: "The levels of innovation we expect from Apple have fallen off a cliff. "All the new features are things that Samsung and rivals have been doing for a while, such as larger screen size. "This will of course keep the fanboys installed for another launch and help the share price stay strong." Dunn believes the lack of NFC will be a "massive disadvantage" for the mobile market. He said: "It is Apple realising they can’t win in the mobile payments market, so taking its ball indoors in a move which could sabotage the market and innovation." He called the launch of 4G nothing more than a "hygiene factor" with Apple having to keep up with other markets. The launch comes one year after the iPhone 5 was expected to launch. Instead, Apple unveiled the iPhone 4S, whose only major update was Siri, the personal assistant. Apple’s most recent results showed that sales of iPhone were slowing. The technology firm sold 26 million iPhones during the quarter ended 30 June, a 28% increase year on year. Last night, Apple also revealed a new range of iPod Touches, Nanos, and an updated iTunes.